The media and entertainment industries are evolving at an unprecedented rate, driven by the twin needs to reduce operating costs and simultaneously generate more revenue from increasingly competitive and uncertain markets. Media companies are in many respects an early adopter of big data technologies because it enables them to drive digital transformation, exploiting more fully not only data which was already available, but also new sources of data from both inside and outside the organization. This chapter presents a wide-ranging overview of the state of the art of big data in the media sector. It introduces the industrial needs, application scenarios, and other aspects of the sector and describes how they influence, and are influenced by, products, customers, and processes. Finally, the research is distilled into a comprehensive set of requirements across the entire big data value chain, alongside the consolidated roadmap tracking the development of key technologies to support semantic data enrichment, data quality, data-driven innovation, and data analysis. The media and entertainment industries have frequently been at the forefront of adopting new technologies. The key business problems that are driving media companies to look at big data capabilities are the need to reduce the costs of operating in an increasingly competitive landscape and, at the same time, the need to generate revenue from delivering content and data through diverse platforms and products. It is no longer sufficient merely to publish a daily newspaper or broadcast a television programme. Contemporary operators must drive value from their assets at every stage of the data lifecycle . The most nimble media operators nowadays may not even create original content themselves. Two of the biggest international video streaming services, Netflix and Amazon, are largely aggregators of others’ content, though also offering originally commissioned content to entice new and existing subscribers. Media industry players are more connected with their customers and competitors than ever before. Thanks to the impact of disintermediation, content can be generated, shared, curated, and republished by literally anyone with an Internet-enabled device. Global revenues from such devices, including smartphones, tablets, desktop PCs, TVs, games consoles, e-readers, wearable gadgets, and even drones were expected to be around $750 billion in 2014 (Deloitte 2014). This means that the ability of big data technology to ingest, store, and process many different data sources, and in real-time, is a valuable asset to the companies who are prepared to invest in it. The Media Sector is in many respects an early adopter of big data technologies, but much more evolution has to happen for the full potential to be realized. Better integration between solutions along the data value chain will be essential in order to convince decision-makers to invest in innovation, especially in times of economic uncertainty. Also, the solutions market is dominated by US, and, increasingly, Asian firms. Therefore, there is an economic imperative for Europe to both develop and use big data technologies more extensively. Media and entertainment content and platforms have a global reach that many companies in other sectors, even retail and manufacturing, would be envious of. Case studies of successful big data projects in media have tended to come from the left-hand end of the data value chain (i.e. data acquisition and analysis). However, there is a need to identify both exemplars and gaps in the curation and usage of big data, as these are significant areas of competitive advantage for media organizations. Big data contributes to the bottom line by enabling organizations to pursue digital transformation. According to PWC (2014), this forges the trust of consumers, creates the confidence to innovate with speed and agility, and empowers innovation. Unlike some other sectors, the vast majority of actionable data in the media sector is already in digital form (and analogue products such as newspapers have been created through digital technologies for some years now). However, this does not mean that organizations are deriving the fullest possible financial benefit or cost efficiencies from both their existing data and new sources of data. There is a growing body of evidence that there is much work to do at research and policy levels to support the burgeoning ecosystem of diverse businesses engaged in analysing, enhancing, and delivering content and data. The media sector has always generated data, whether from research, sales, customer databases, log files , and so on. Equally, the vast majority of publishers and broadcasters have always faced the need to compete right from the earliest days of newspapers in the eighteenth century. Even government or publicly funded media bodies have to continually prove their relevance to their audiences, in order to stay relevant in a world of extensive choice and to secure future funding. But the big data mind-set, technical solutions, and strategies offer the ability to manage and disseminate data at speeds and scales that have never been seen before. Products and Services: Big data-driven media businesses have the ability to publish content in more sophisticated ways. Human expertise in, e.g., curation , editorial nous, and psychology can be complemented with quantitative insights derived from analysing large and heterogeneous datasets. But this is predicated on big data analysis tools being easy to use for data scientists and business users alike. Customers and Suppliers: Ambitious media companies will use big data to find out more about their customers—their preferences, profile, attitudes—and they will use that information to build more engaged relationships. With the tools of social media and data capture now widely available to more or less anyone, individuals are also suppliers of content back to media companies. Many organizations now back social media analysis into to their orthodox journalism processes, so that consumers have a richer, more interactive relationship with news stories. Without big data applications, there will be a wasteful and random approach to finding the most interesting content. Infrastructure and Process: While start-ups and SMEs can operate efficiently with open source and cloud infrastructure, for larger, older players, updating legacy IT infrastructure is a challenge. Legacy products and standards still need to be supported in the transition to big data ways of thinking and working. Process and organizational culture may also need to keep pace with the expectations of what big data offers. Failure to transform the culture and skillset of staff could impact companies who are profitable today but cannot adapt to data-driven business models . Six application scenarios for the media sector were described and further developed in Zillner et al. (2013, 2014a). All of these scenarios represent tangible business models for organizations; however, without support from big data technologies, companies will not be able to mature their existing pilots or small-scale projects into future revenue opportunities (Table 14.1). Large volumes of data become available to a media organization. Single or multiple datasets require analysis to derive insight, find interesting stories, and generate material. This can then be enhanced and ultimately monetized by selling to customers. Processing of large user-generated content datasets. Batch and real-time analysis of millions of tweets, images, status updates to identify trends and content that can be packaged in value-added services. Developing recommendation engines using multiple data sources. Applications that exploit collaborative filtering, content-based filtering, and hybrids of both approaches. Like all businesses, media companies aim to maximize revenue, minimize costs, and improve decision-making and business processes. Aim to understand customers on a very detailed level, often by analysing many different types of interaction (e.g. product usage, customer service interactions, social media, etc.). Operate in crowded sub-sectors such as digital marketing or book publishing, where very few players have dominance, and consumer preferences and fashions can change very rapidly. Diversify service offerings wherever possible. Most significant European media companies operate in many areas, for example, newspaper publishers, websites, and commercial apps; or broadcasters may also sell broadband access. Communicate to build influence within society, e.g. politically. This is less tangible than just selling products but seen as equally important by media owners or governments. Increased consumer awareness and concern about how personal data is being used. There is regulatory uncertainty for European businesses that handle personal data, which potentially puts them at a disadvantage compared to, say, US companies who operate within a much more relaxed legal landscape. Insufficient access to finance for media start-ups and SMEs . While it is relatively easy to start a new company producing apps, games, or social networks, it is much harder to scale up without committed investors. The labour market across Europe is not providing enough data professionals able to manipulate big data applications, e.g. for data journalism and product management. Fear of piracy and consumer disregard for copyright may disincentive creative people and companies from taking risks to launch new media and cultural products and services. Large US players dominate the content and data industry. Companies such as Apple , Amazon , and Google between them have huge dominance in many sub-sectors including music, advertising, publishing, and consumer media electronics. Differences in penetration of high-speed broadband provision across member countries, in cities, and in rural areas. This is a disincentive for companies looking to deliver content that requires high bandwidth, e.g. streaming movies, as it reduces the potential customer base. Table 14.2 is intended to give a flavour of the data sources that most media companies routinely handle. One table lists some categories of data that are generated by the companies themselves, while the second shows third-party sources that are or can be processed by those in the media sector, depending on their particular line of business. Consumer profile details including customer service interactions. Volume—Large amounts of data to be stored and potentially mined. Variety applies when considering the different ways customers may interact with a media service provider—and hence the opportunity for the business to “join up the dots” and better understand them. Network logging (e.g. for web or entertainment companies operating their own networks). Velocity—Network issues must be identified in real-time in order to resolve problems and retain consumer trust. Organizations own data services to end users. Characteristic(s) will depend on business objective of the data, e.g., a news agency will prioritize speed of delivery to customers, a broadcaster will be focused on streaming content in multiple formats to multiple types of device. Consumer preferences inferred from sources including click stream data, product usage behaviour, purchase history, etc. Volume—Large amounts of data can be gathered. Velocity will become pertinent where the service needs to be responsive to user action, e.g., online gaming networks which upsell extra features to players. Commercial data feeds, e.g., sports data, press agency newswires. Velocity—Being first to use data such as sports or news events builds competitive advantage. Network information (where external networks are being used, e.g., messaging apps that piggyback on mobile networks). Velocity—Network issues must be identified in real-time in order to ensure continuity of service. Public sector open datasets . Veracity—Open data may have quality, provenance, and completeness issues. Veracity—crowdsourced data may have quality, provenance, and completeness issues. Social media data, e.g., updates, videos, images, links, and signals such as “likes”. Volume, variety, velocity, and veracity —Media companies must prioritize processing based on expected use cases. As one example, data journalism requires a large volume of data to be prepared for analysis and interpretation. On the other hand, a media marketing business might be more concerned with the variety of social data across many channels. Each type of data source is matched to a key characteristic of big data. Customarily, the technology industry has talked of “the three Vs of big data”, that is, volume , variety , and velocity . Kobielus (2013) also discusses a fourth characteristic—veracity. This is important for the media sector because consumer products and services can quickly fail if the content lacks authoritativeness, or it is of poor quality, or it has uncertain provenance. According to IBM (2014), 27 % of respondents to a US survey were unsure even how much of their data was inaccurate—suggesting the scale of the problem is underestimated. The Media and Entertainment Sectorial Forum were able to identify and name several requirements, which need to be addressed by big data application in the domain. The requirements are distinguish between non-technical and technical requirements. It is important to note that the widespread uptake of big data within the media industry is not solely dependent on successful implementation of specific technologies and solutions. In Zillner et al. (2014b), a survey was undertaken among European middle and senior managers from the media sector (and also the telecoms sector, where large players are increasingly moving into areas that were once considered purely the realm of broadcasters, publishers, etc.). Respondents were asked to rank several big data priorities based on how important they would be to their own organizations. 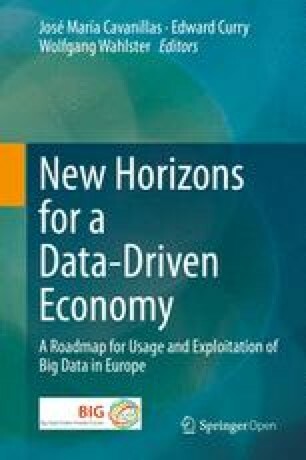 It is striking that all survey participants identified the need for a European framework for shared standards, a clear regulatory landscape, and a collaborative ecosystem—implying that businesses are suffering from a lack of confidence in their ability to see through the hype and really get to grips with big data in their enterprises. Another area ranked as very important by a notable proportion of respondents was making solutions usable and attractive for business users (i.e. not just data scientists). Table 14.3 lists 37 requirements that were distilled from the work of the Media Sector Forum. Each requirement is matched to a business objective (although of course in practice some requirements could meet more than one objective). The five columns at the right-hand side of the table place each requirement in its appropriate place(s) along the big data value chain. Media, as a mostly customer-facing, revenue-generating economic sector, has many critical needs in data curation and usage . Of all the sectors discussed in this book, media is arguably the one that changes most suddenly and most often. New paradigms can emerge extremely quickly and become commercially vital in a short space of time (e.g. Twitter was founded only in 2006 and now has a market capitalization of many billions of dollars). The year 2015 onwards will see many media players and consumers alike experimenting with drones (more strictly, “unmanned aerial vehicles ”, or UAVs) to see if captured footage can be monetized either directly as content or indirectly to attract advertising. Figure 14.2 and Table 14.4 consolidate the outcomes of the research completed in Zillner et al. (2013, 2014a), along with additional background research. Figure 14.1 maps out the methodology used to derive the sector roadmap, showing how iterative engagement with industry supported at every stage the definition of the needs and technologies around big data for the media sector. Any roadmap must be cognisant of the risk that it will be out of date before it is even published. Nevertheless, the key headings shown in the figures in this section are strongly predicted to remain highly relevant to the sector for the following reasons. Semantics is a long-established and now fast-developing field that is finally fulfilling its academic promise. Major media applications such as “intelligent personal assistants”, e.g. Siri and Cortana , are underpinned by “artificial intelligence” and semantic analysis technology. More development is needed to help commercial organizations in Europe exploit the potential of ontologies, graph databases, and curation platforms. The key technological developments in this area include open data and data standards generally to aid interoperability. Also key are capabilities for processing unstructured (especially natural language) data streams. Finally, there is a need for back-end systems that can absorb different types of data with as little friction as possible, by minimizing the need to define data schemas upfront. Three key technologies underpinning the drive for high-quality innovation are machine learning at enterprise scale; the Internet of Things (IoT) , which will exponentially increase the volume and diversity of data streams available to anyone involved in media or data-driven storytelling; and finally, tools to better interpret customer interactions with products and services. Media and entertainment companies need to analyse data not only at the customer and product levels, but also at network and infrastructure levels (e.g. streaming video suppliers, Internet businesses, television broadcasters, and so on). Key technologies in the coming years will be descriptive analytics , more sophisticated customer relationship management solutions, and lastly data visualization solutions that are accessible to a wide range of users in the enterprise. It is only by “humanizing” these tools that big data will be able to deliver the benefits that data-driven businesses increasingly demand (Table 14.4). Making sense of data streams , whether text, image, video, sensors, and so on. Sophisticated products and services can be developed by extracting value from heterogeneous sources . Exploiting big data step changes in the ability to ingest and process raw data , so as to minimize risks in bringing new data-driven offerings to market. Curating quality information out of vast data streams, using algorithmic scalable approaches and blending them with human knowledge through curation platforms. Accelerating business adoption of big data. Consumer awareness is growing and technical improvements continue to reduce the cost of storage and analytics tools among other things. Therefore, it is more important than ever that businesses have confidence that they understand what they want from big data and that the non-technical aspects such as human resources and regulation are in place.